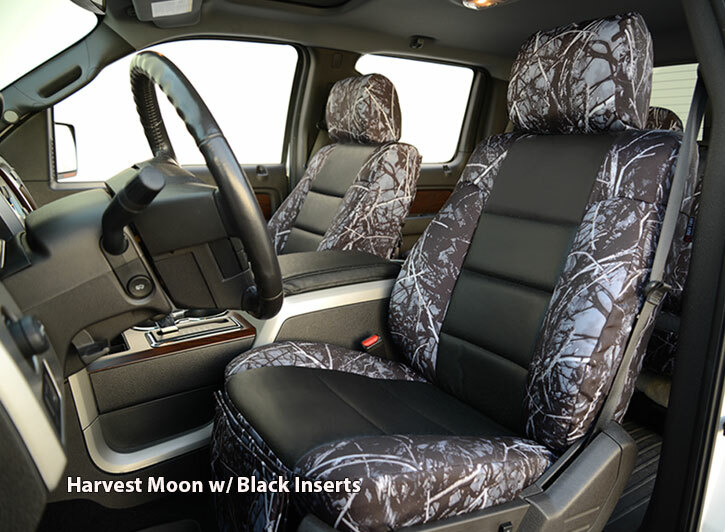 ShearComfort’s Moon Shine Camo Seat Covers show off your active lifestyle and passion for the outdoors. 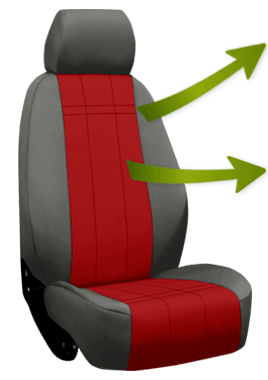 As a part of ShearComfort’s Luxury Line, these seat covers are made of the highest-quality durable, waterproof fabric that is also abrasion resistant and guaranteed to fit your car, truck or SUV perfectly. Choose from five unique Moon Shine patterns: Muddy Girl, Harvest Moon, Undertow, Wildfire, and Toxic. Note: Sof-Touch or Exotic can be combined with Moon Shine as a Trim (sides & back) or Insert fabric. Insert is available in Perforated or Solid Sof-Touch. This creates a unique, luxurious, and stunning look to your Camo seat covers. This high end simulated leather has a soft feel. It looks and feels so good that people often mistake it for genuine leather. Sof-Touch is also water and mildew-resistant, protecting your seats from stains and spills. The UV stabilized pigments and top coating ensure that your seat covers will last a very long time. 1. Material Quality and Durability - Made from a blend of 600 denier polyester and nylon, Luxury Line Moon Shine Camo Seat Covers are a tough, abrasion and water-resistant product and are easy to clean with a damp cloth. ShearComfort’s Moon Shine Seat Covers are the ultimate automotive accessory for people who love the outdoors. Since most outdoor activities involve getting dirty, you won’t have to worry about damaging your interior with these seat covers. 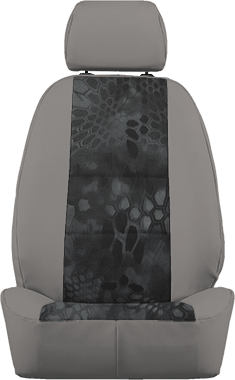 This product will protect your vehicle’s original seats from anything the environment throws at them so you can just hop in and head out into your next excursion. Product Review: Although I miss the green hibiscus print you used to have, I love this camo fabric. It is durable, and easy to clean. I love the fact that it was cut perfectly to fit my seats. The velcro closure is GENIUS. Now, I don't have to worry about torn straps and/or broken or missing clips. My only regret is that you don't make a removable, fitted, water-resistant bedliner, with elastic or velcro that I could use for protection when I fold down my third row. As it is, only half is protected by the seat cover. Please consider manufacturing one! Thank you so much!! General Experience: Ordering was relatively painless.